Goal of WP4 is to develop robust monitoring concepts and components which enable the robot to detect as early and complete as possible dangerous situations in a weakly structured dynamic environment. Since the robot has to share its working space with the human it should be able to interact with him and to act independently (autonomously) without interfering with his actions. 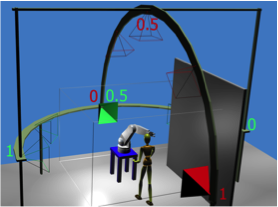 Therefore, both the presence of uninvolved moving persons or technical objects (e.g., human performing splice positioning task while the robot is drilling as considered in the use case in WP8) as well as humans and work-pieces which physically cooperate with the robot (e.g., human and robot performing a fastening operation as assumed in the use case in WP8) will be considered.